Bitcoin prices plunged again Monday morning after Mt.Gox, the major exchange for the virtual currency, said technical problems require it to continue its temporary ban on many customer withdrawals. Mt.Gox said it has discovered a bug that causes problems when customers try to use their account to make a transfer or payment of bitcoins to a third party. It said the problem is not with Mt.Gox software but affects all transfers of bitcoins to third parties. It is allowing transfers to Mt.Gox bitcoin addresses as well as currency withdrawals. Trading in bitcoins also continues. But the exchange said it was suspending transfers and third-party payments until the problem is fixed. A bug is allowing a third party receiving a bitcoin transfer to make it look as if the transfer did not go through, which can lead to improper multiple transfers, Mt.Gox said. 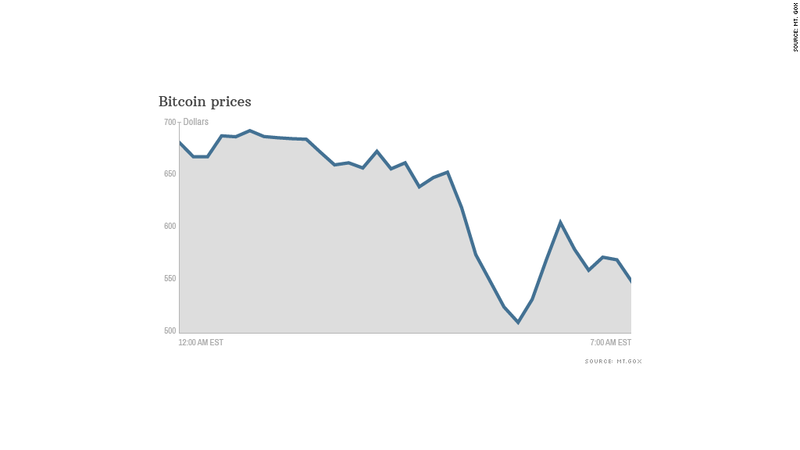 Bitcoin prices on Mt.Gox plunged from about $693 just early Monday to $510 at 6 a.m. ET, soon after the statement was posted. Prices rebounded to above $600 following that plunge and hovered around $570 Monday evening. Prices had been as high as $831 just after 7 p.m. Thursday before Mt.Gox's halt of withdrawals was first disclosed early Friday morning. Mt.Gox tried to put the best face on the technical problems in its latest statement, noting that the technology is "very much in its early stages." "What Mt.Gox and the Bitcoin community have experienced in the past year has been an incredible and exciting challenge, and there is still much to do to further improve," it said.